WELCOME to a great place for a no-work, hassle free, party to remember. All For Fun is just that… a place where children and caregivers can play that’s fun, clean and safe. We promote learning, exploration and creativity…all while having fun. 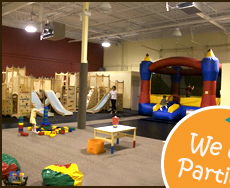 Our 6,000 square foot facility is designed to meet the needs and interests of children of all ages. Whether running around on the climbers, jumping in the inflatable castle or building a fort with our jumbo blocks, your child will have a Party to Remember. And when the party’s over and no one wants to leave, just tell them you can come back anytime for our Daily Play or better yet, register for one of our Classes and get a discount for same day drop-in play.